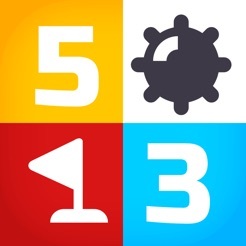 A minimalist mashup of Minesweeper and Sudoku. Logic puzzle perfection. 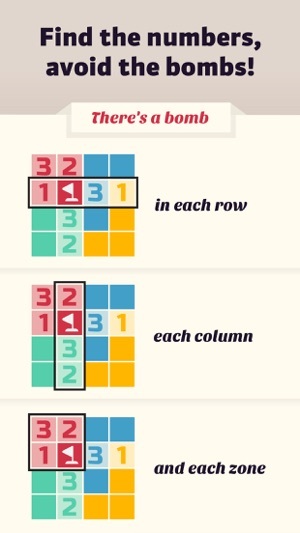 Every row, column and zone contains a bomb and one of each number. 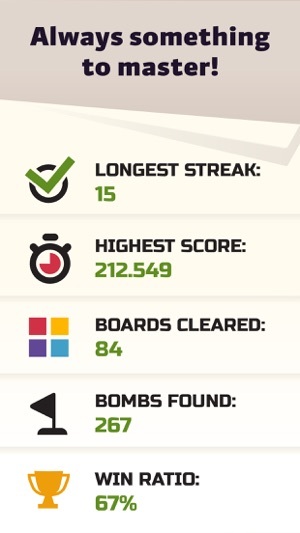 Tap the numbers, avoid the bombs. Relax through the methodical application of logic. Race the clock for your global ranking. Test your mental powers by switching up the difficulty. Play for a lifetime without repeating a board. Record streaks, high scores and stats. Enjoy uninterrupted from the moment you download it. Very interesting concept. Turns out Minesweeper and Sudoku go well together, and I'm one of hopefully a number of people out there who have enjoyed both a great deal. The game is divided into regions which contain one of each number (more numbers in larger boards) which may take any connected shape. Each axis may only contain one of each number and a bomb. Bombs are located by identifying all numbers in an axis or region. So far the game runs very smoothly and the user interface and colors are great. Background music is soothing with very short looped wind instrument sound mixed with rain drizzle though I worry it's repetition may wear thin. There appears to be no more detailed tools ala Sudoku for calculating cell contents—you just look at the board and determine numbers where you can and move along. I have no idea yet how this impacts more advanced content. Which is to say, if advanced content becomes frustrating without such tools or if the game falls short of more advanced play due to this limitation. Maybe as I play this simply never matters. 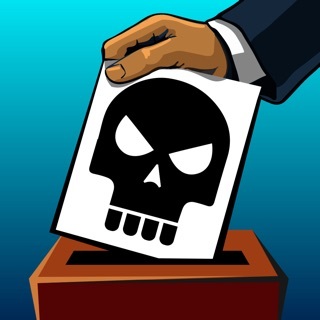 If you enjoy either game give this a shot! 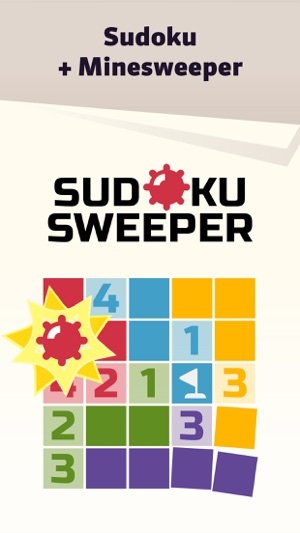 Both Sudoku and Minesweeper offer similar (at least in my opinion) avenues of enjoyable gameplay. With the benefit in this case being that perhaps the guessing least worst decision approach of clearing complex Minesweeper boards is sacrificed for the seeing the present solution approach of properly constructed Sudoku boards. Decently challenging. Not quickly mastered. Nice mix of sudoku and minesweeper. 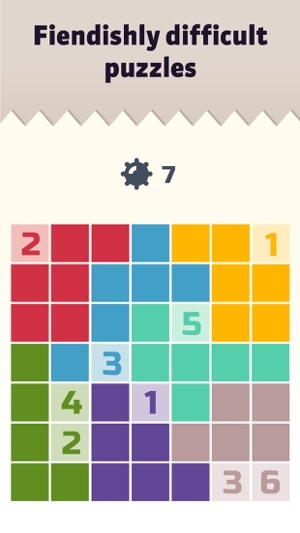 In fact, I think these puzzles are more like sudoku than minesweeper. 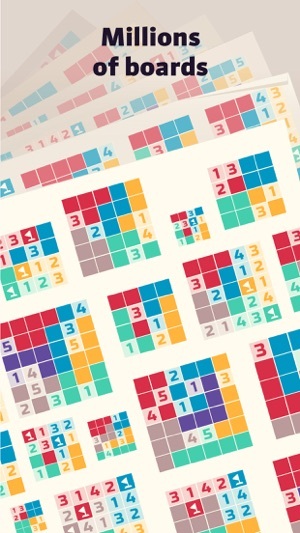 The puzzles don't require nearly as much analytical depth as a typical Diabolical sudoku, though you can certainly find yourself chasing a nishio or two around the grid occasionally. And, of course, without pencil marks. Two things to note: the smiley face will give you a fresh puzzle if you don't like the looks of the one you first get. (That wasn't obvious at first.) Also, if you do hit a bomb, it will take you back to the previous difficulty. So, if you blow up a 7x7 puzzle, it will start you over on a 6x6 puzzle. If I could put a couple things on a wish list for the future, my first wish would be for a landscape mode for iPad. Also, I would love to have a setting that required double-tapping. Accidents happen. The game needs a bit of polish in its interface, and maybe a few lines of Help text. But it's better crafted that a lot of similar first-releases. It does occasionally crash or hang, but not often, and, so far, hasn't lost progress in any of these crashes. Download this. 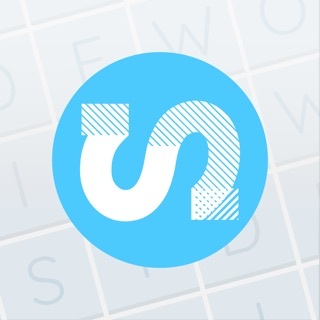 It is clever, addicting, and does the same sort of mind-clearing that good sudoku puzzles do while fitting into those times you can't dedicate a clear block of time to a tough sudoku. Perfect mashup of two classics! Please optimize for iPad Pro 11 inch!! These two classic puzzles play very well together! 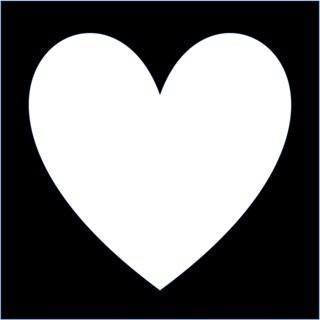 This app has simple, clean graphics. I wish there was a way to select the grid (4x4, 5x5, 6x6 etc.) 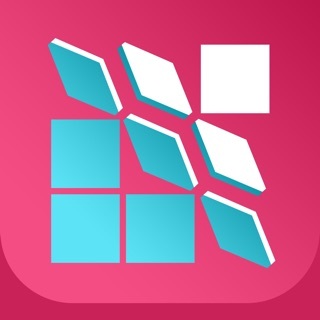 without having to maintain a flawless streak and leveling up to the next grid size. My only real gripe with this app, however, has nothing to do with gameplay. It is the fact that it is not optimized for the iPad Pro 11 inch’s new screen aspect ratio. There are black bars at the top and bottom of the iPad screen that I would rather not see while playing this game. Mr. Biden, if you read this, will you please update this app and optimize it for the iPad Pro 11 inch?